We are specialized and dedicated linguistics professionals. 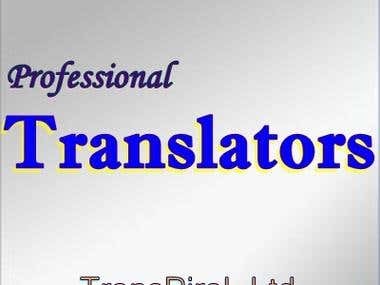 We have over 5 years of combined translation, transcription and Proofreading services experience. Our know-how includes strong management that has been working in the translation and transcription field since 2012. Our linguistic team is comprised of hundreds of professionals that are not only well versed but experts in many areas, such as, legal, medical, technological, financial, engineering, scientific etc. Our mission is to provide our clients with the ideal service solution. We work extremely hard to enhance positive and beneficial relationships with our clients, staff and vendors. As a language services company, we are friendly, personal, prompt, efficient and responsive. The many years of experience under our belts have taught us the importance of providing a top quality product combined with exceptional service.